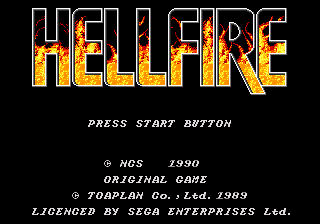 Hellfire (ヘルファイアー) is a 1989 arcade shoot-em-up developed by Toaplan and published by Taito. It was ported to the Sega Mega Drive in 1990 by Toaplan and NCS. Hellfire does not follow the typical powerup system of most shmups of the time. Instead, your ship, the CNCS1, can fire either straight to the right (pink), straight to the left (yellow), straight up and down (green), or diagonally in four directions (blue), switching between these modes by pressing . shoots, and shoots the Hellfire, a much more powerful version of your shot which comes in limited quantities for each level. The Japanese version has louder shots sound effect than the NTSC-U & PAL releases.